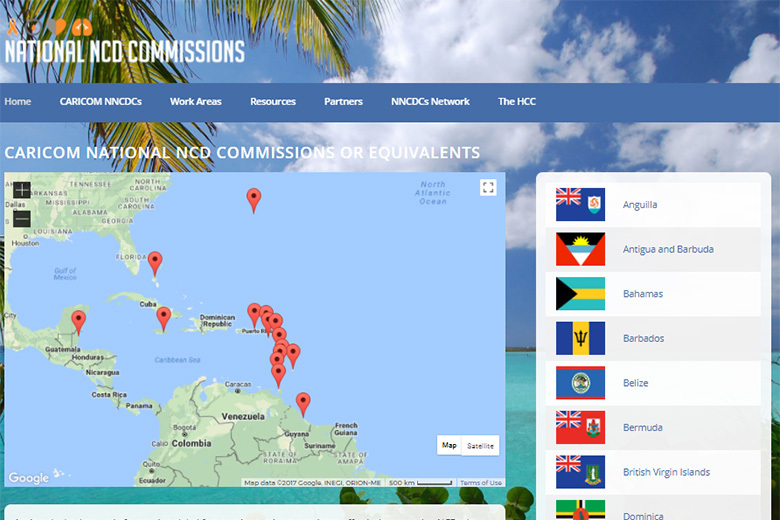 With support of the Commonwealth Secretariat the HCC has worked with National NCD Commissions (and equivalents) across CARICOM to develop an online portal which contains detailed information on all active NNCDCs in the Caribbean. The portal is an active space which will be updated on an ongoing basis. It is meant to be a resource for existing NNCDCs as well as those interested in learning more about the CARICOM experiences with these multisectoral platforms. Against the background of a growing global focus on innovative strategies to effectively respond to NCDs there has been increasing attention paid to the value of National NCD Commissions as platforms for achieving truly multisectoral, health-in-all-policies responses to the NCD epidemic. The 2007 Port of Spain Declaration: Uniting to Stop the Epidemic of NCDs, issued by the Heads of Government of CARICOM in 2007 “strongly encouraged the establishment of National Commissions on NCDs, or analogous bodies, to plan and coordinate the comprehensive prevention and control of chronic NCDs”. In response to this call, since 2007, many CARICOM countries have responded by establishing National NCD Commissions to foster a whole of society and whole of government response to chronic diseases. The HCC is committed to engaging all sectors of society around NCDs, and identifying and documenting the most effective mechanisms for achieving this objective, such as the National NCD Commission model. To this end, since 2014, with the support of partners, the HCC has invested considerably in assessing National NCD Commissions and their equivalents in order to gain a better understanding of their challenges and successes and translates these learnings into actionable recommendations for strengthened and effective NNCDCs. This National NCD Commissions Portal, developed with the support of the Commonwealth Secretariat, provides a snapshot of the work done over the years and aims to be a resource for existing NNCDCs as well as those interested in learning more about the CARICOM experiences of these multisectoral platforms.